Foster Creativity: Go, Team, Go! 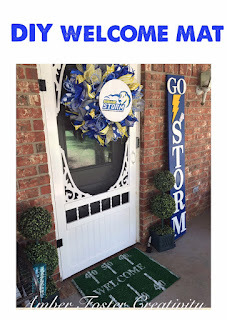 No matter what team you are rooting for this football season, this easy DIY doormat will make a perfect addition to you porch décor! First we start with AstroTurf! I bought 2 feet from Lowes off of the big roles in the back where they keep the carpet. Other materials I used were: white acrylic paint, paint brush, scissors, painter's tape, ruler, and stencils. I started off by cutting the AstroTurf into a 2x3 foot section. Then I folded the piece in half to make a crease in order to find the center. I then taped off about 1 inch wide lines up and down in the center, and then halfway through the left and right sides and a small strip on the edge. I then placed one of the stencil blanks in the dead center and ran a strip of tape across the top and bottom of the blank the width of the mat. I then dabbed paint in between the taped lines and stenciled on the letters and numbers. I did make the mistake of not stenciling the numbers as close to the lines as I would have liked in this particular example, but I still love how it turned out! I just love how cute the finished product turned out!